The painkiller named after the Greek god of dreams has a big birthday. Opium had already been killing pain for centuries when a 20-year-old pharmacist’s apprentice in Einbeck, Germany, began tinkering with the stuff. Friedrich Wilhelm Adam Sertürner noticed that some batches were more potent than others and took the novel step of trying to isolate the opium poppy’s active ingredient. In 1805, after two years of work, Sertürner separated an alkaloid compound he named “morphium,” after Morpheus, the Greek god of dreams. To test his new compound, Sertürner was not averse to inflicting misery. First he tried the compound on neighbor-hood rats and dogs, finding that it put them to sleep and eventually killed them. That’s when he administered a lower oral dose (though still 10 times more potent than dosages prescribed today) to himself and three teenage friends, making them all violently ill. But after further trials revealed that morphium was highly effective in soothing his own toothache, Sertürner published his discovery. By the 1820s the compound, renamed morphine, was available from many chemical suppliers, helping along the birth of the pharmaceutical industry. But it took the invention of the hypodermic needle in the 1850s (morphine is less potent than other opiates when administered orally) to reveal morphine’s full potential for good and ill. 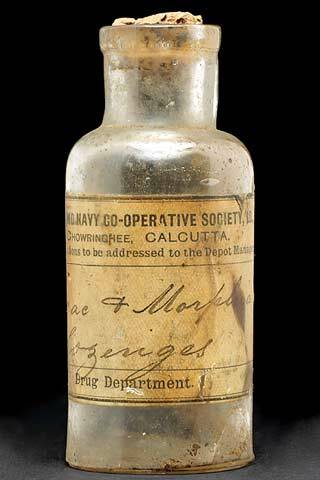 Injected morphine was widely used in the medical tents of the Civil War, resulting in hundreds of thousands of veterans returning home with the “soldier’s disease.” In an ironic twist worthy of fiction, the search for a less addictive opiate led in 1874 to the discovery of heroin—named for its heroic ability to fight pain—which was made in mass quantities from 1898 until U.S. production was halted in 1913. An all-in-one medication reduced such cardiovascular risk factors as blood pressure and heart rate.